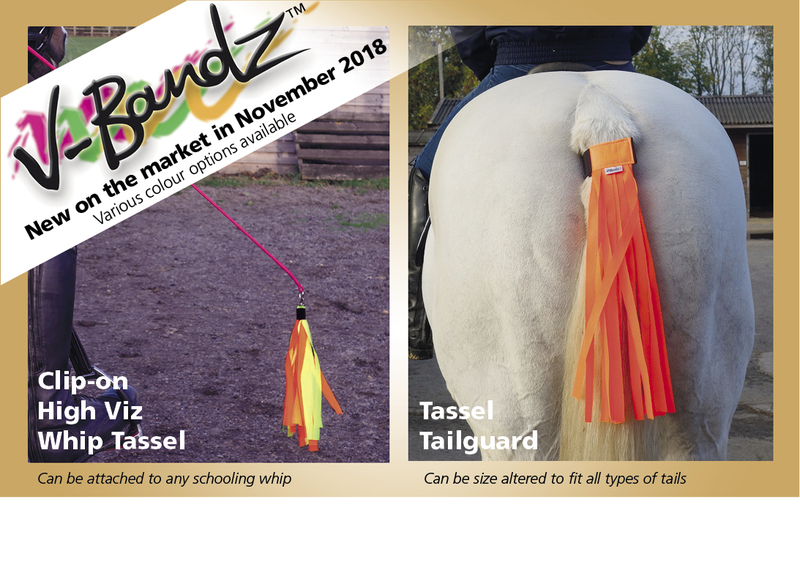 V-Bandz Ltd has been a leading innovator in equestrian high visibility for 17 years. 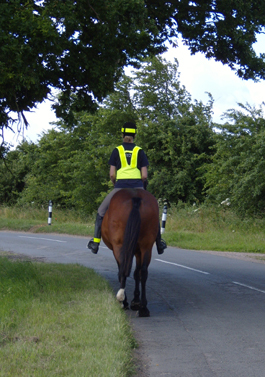 Our product range for the rider has been tested and certified to the European standard of EN1150 (waistcoats and tabards) and EN13356 (accessories such as rider hatbands) which means that you can be sure you are buying a quality product which will last and provide additional safety day and night. 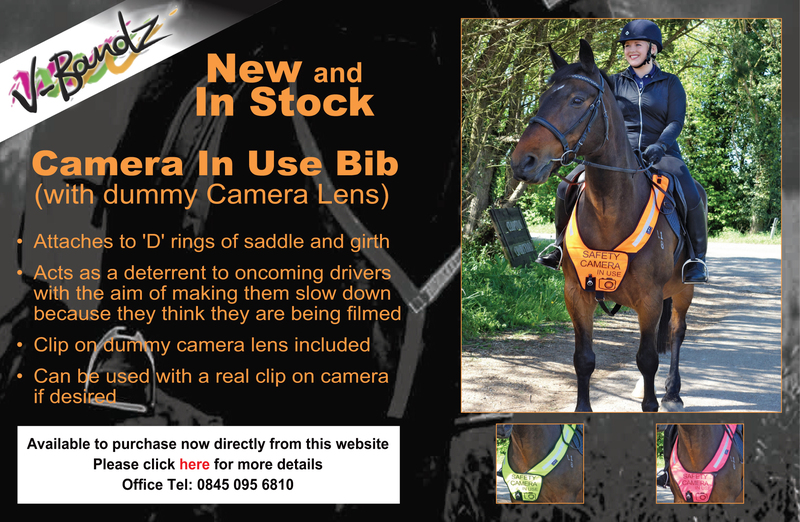 CE-certification is compulsory for all rider high visibility wear - if the item doesn't comply - DON'T BUY! . The Dangers of riding in bright summer sunlight. 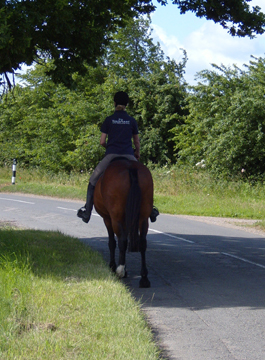 This horse and rider are visible to drivers at this point in the road but the moment they hit the shade of the trees overhanging the road they would become nearly invisible to drivers if they were not wearing high viz. Drivers need time for their eyes to adapt to the shade. Please make sure you wear lots of high viz if this sort of riding scenario applies to you. The drivers will see you so much quicker. Plain yellow might not be the best colour to be seen under the trees, which is why we really advocate that you mix your high viz colours. Why bother to wear Hi-Viz? 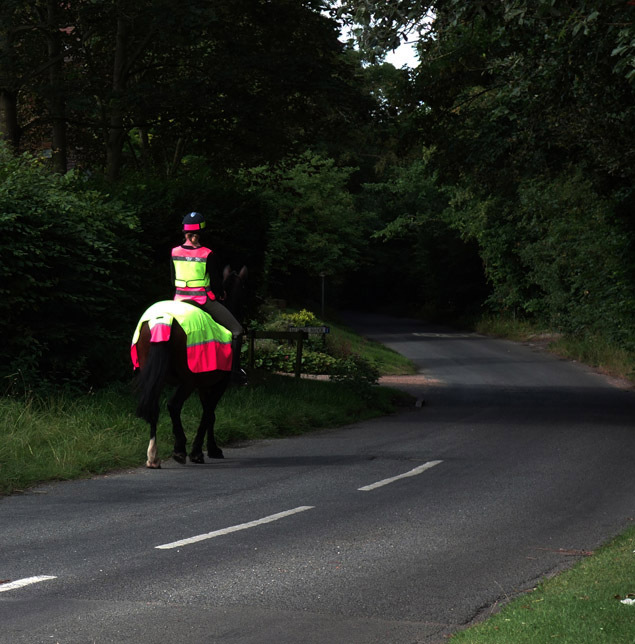 Wearing High Viz means even in the brightest of sunlight you and your horse will be much more visible to drivers. The fluorescent colour is seen by the human eye up to 3 seconds sooner than any other colour, even white. This means that a car travelling at 50mph could see you 250 meters sooner than when you are wearing no hi-viz at all. Take a look at the pictures below; these were taken on a bright sunny day under the shade of trees. We are not saying that car drivers cannot see the horse on the left - but they will certainly see the horse on the right first - hence the extra 3 seconds - Keep Safe! A great waistcoat designed especially for riding.